When it gets to Vintersorg I am an unabashed, but a peculiar, sort of, fan. My first album from this 2-man project was Cosmic Genesis, the opus which still remains one of my favorite albums ever. While being a strong album throughout, Astral and Arcane, A Dialogue with the Stars and the title track are pure genius marrying post-black, symphonic metal and Northern folk melodies, coupled with Mr. Vintersorg coming into his own with his instantly recognizable, remarkable vocals. After Cosmis Genesis I tracked back all of Vintersorg’s discography and loved how Hednikshjartad, Till Fjalls and Odemarkens Son built to what Cosmis Genesis finally became. Naturally, I also bought every Vintersorg album after Cosmic Genesis. Hoping the magic will be recaptured, I felt there was no stronger well-wisher for Mr. V than me, not even the singer/composer himself. All of his forays into the more progressive side of things, getting to do Visions from the Spiral Generator, The Focusing Blur and Solens Rotter with the expanded lineup, I listened to them all, and while not completely accepting the new direction at first, with time those albums make better sense to me now. Yet, Cosmic Genesis still sits alone, atop the pinnacle. The previous album Jordpuls started this prolific creator on the path to a quadrilogy, each album dedicated to one element of nature. A clear shift back to the original Vintersorg sound, Jordpuls (dedicated to earth) was not consistent throughout, just like its predecessor Solens Rotter. A pair of stronger tracks (Klippor Och Skär, in particular) did not hide some average pass-by moments. When it is Vintersorg I have super-high standards, I need to remain engaged throughout. Subsequently then, I am happy to report that after at least one month worth of on-and-off listening to Orkan (symbolizing the element of air) this album, while still not Cosmic Genesis, is probably going to occupy the second-highest step on the Vintersorg podium in my collection. In Orkan the inspiration guides Vintersorg to one more time synthesize massive wall of sound, harsh verses, cleaner catchy choruses and, overall, create music revealing his Northerner soul. The harsher moments of Istid and Ur stjärnstoft är vi komna are never brutal, while the folk touches in all of the songs are never gimmicky. Vintersorg’s more extreme vocals are very legible, while his soaring clean voice simply brightens the soul, and is still probably the main attraction, overshadowing some of the underlying music. Very cleverly, Vintersorg multitracks his vocals throughout the album, the listener subjected to an army of million of Vintersorgs, all coming at you in slightly different register, occupying all possible perches in the audible spectrum. Listening to Istid, you will swear that a true chorus has been recruited to participate in this recording. With some of his riffing on Orkan Vintersorg vaults himself to what I call Grieg-like territory. Just like the famous Norwegian composer in Peer Gynt, Vintersorg has the audacity to announce the main riff in Polarnatten, Myren and the title track, right from the get-go, only to build around something simple, yet totally captivating and completely authentic. All of these songs have unbelievable flow, connecting from quieter piano/clavesin parts to more dissonant parts, where the main riff of Myren begins careening sideways. 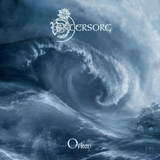 With this flow more befitting water than air (as the cover art also would make you think), orkan still means “hurricane”, and the album does mix both water and air taking the listener by the storm. In fairness, after the title track which concluded the run of five super-strong songs, Orkan can’t quite sustain itself for me, and that is why it is still second best to Cosmic Genesis. Thundering double bass with airy vocals above them in Norrskenssyner and some of the blacker moments next to violin and chamber music brief vestiges in Havets nåd are interesting, but overall there is a little bit of a slip in the album’s second half, especially with the black metal riffs becoming blander in Norrskenssyner and Urvädersfången. Somewhere sometime ago I read that Mr. Vintersorg, Andreas Hedlund, is a teacher. Not sure if this information is true, but if it is, then it would have been very cool to be a student in his music class. To listen to the man sing is pure joy, and to get him to come up with those defining riffs would be the best introduction to Northern Folk Symphonic music in its purest form.